Most times we want to AVOID snakes, but if you are a gardener, you just might be glad to see the "right" kind of snake gliding through your vegetable plants. The "right" kind of snakes consume a wide variety of garden pests. For example, the garter snake feeds on slugs; the sharp-tailed snake adds grubs to their diet, including the destructive Japanese beetle grub. Rubber boas specialize in eating mice and voles, and will even go down their tunnels after them. And gopher snakes snack on mice and rats. Garter snakes are the most common type seen by urban and suburban gardeners. Depending on where you live, there are several species of this type of snake, such as the western terrestrial garter, the northwestern garter, and the common garter. Garter snakes generally breed in the spring and give birth to live young in the late summer or fall. The young are not often seen until the following spring, after they emerge from hibernation after their first winter. 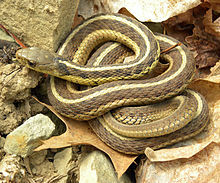 Most young garter snakes do not survive into adulthood because they are killed off by predators, cars, and lawnmowers. The common garter snake (Thamnophis sirtalis) is, well, the most common species in North America. You can generally recognize it by the pattern of yellow stripes on a brown or green background. Their average total length (including tail) is about 22 inches. The average body weight is only about 5 ounces. In summer, it is most active in the morning and late afternoon; in cooler seasons or climates, it restricts its activity to the warm afternoons. In warmer southern areas, the snake is active year-round; otherwise, it sleeps in common dens, sometimes in great numbers. For humans, a bite is not dangerous, though it may cause slight itching, burning, and/or swelling. The snake's salivia is poisonous to its prey. • Walk your lawn before you mow it to scare the snakes into hiding. Lawn mowers are deadly to snakes because they can't hear like humans do. Rather, they feel vibrations. • Provide habitat for snakes if you have room. Old plywood or corrugated metal roofing left loosely on the ground in an out-of-the-way place on your property provides hiking and nesting places for snakes. Old stumps and large rocks also make good snake habitat. Keep in mind that these very habitats can also attract the WRONG kind of snake such as rattlers and other venomous vipers. • Don't use chemicals such as pesticides and fertilizers in areas used by snakes, including lawns. Of course rattlesnakes feed on mice, rats, and other small animals that you might want to get rid of, but they are not exactly the type of slithering creature you want to attract! If you live, work, or play in rattlesnake country, wear snake gaiters or snake boots and be safe!